I received a great question from Colleen. First of all, Thank you so much Colleen for your wonderful question. Second, I hope this helps. I have been thinking about this for a couple of days and this is one solution I came up with. 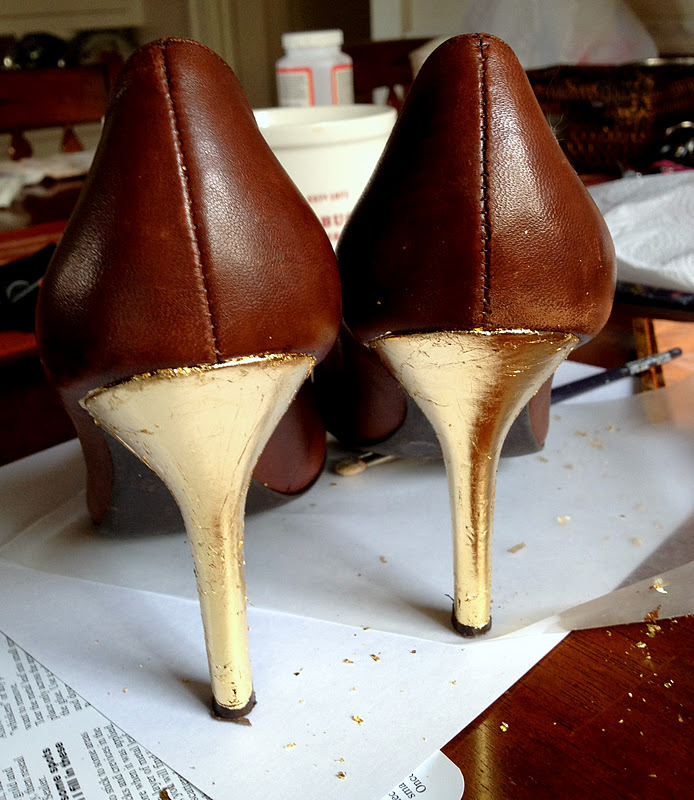 I have to confess, I have NEVER used gold leaf. :( I know , I know, how could that be? Well I have no answer, except maybe I was afraid of it. Afraid it would be too hard or I would totally screw it up. One thing I have learned this year is, "Who really cares if I mess up.?" Not doing something just because you are afraid, makes life way to Safe, and boring. My next 50 years is going to being spent taking chances and doing things that scare me. Don't get me wrong I am not going to go crazy robbing banks, doing drugs or jumping out of planes, but creating things and taking chances with what I love in the style/ art world, well, that is what I 'm talking about. And sometimes, more than not, you create something pretty awesome!! One very small, one medium, paint brush. These are a pair of my Jessica Simpson shoes. 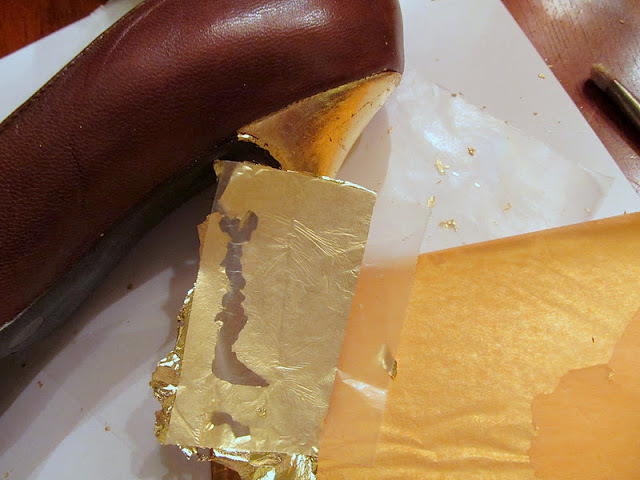 lay this under one sheet of your gold leaf, rub lightly so the gold leaf sticks to the wax paper. This way, it is much easier to apply to your shoe. 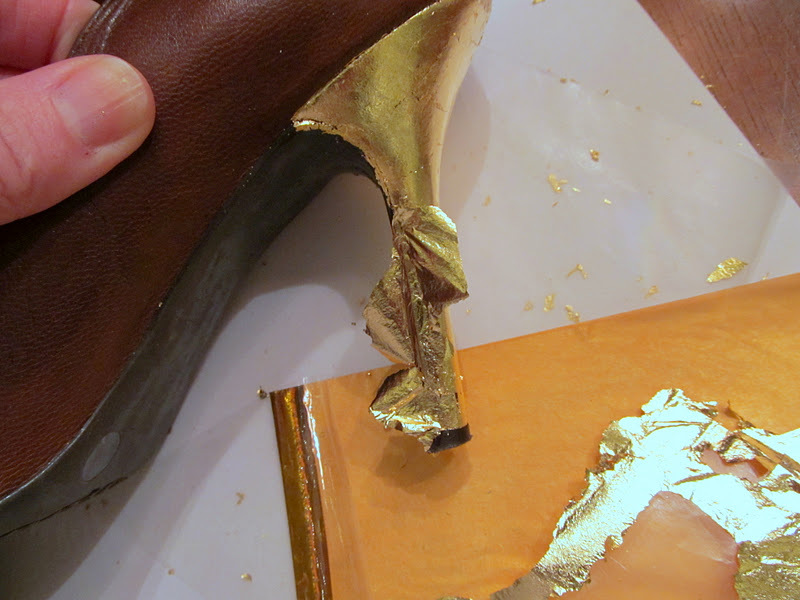 take your medium brush and use it to rub over the gold leaf. and reapply your gold. These shoes only took 1 sheet of gold. 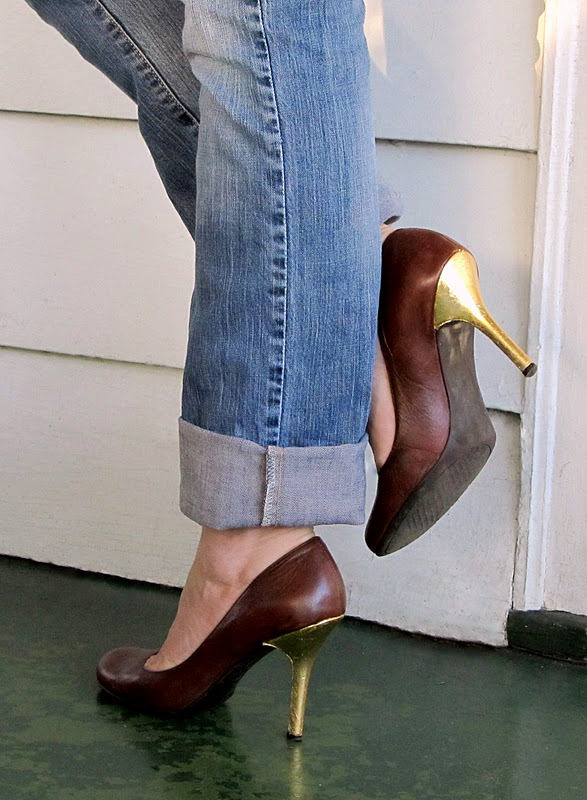 do this until your whole heel is covered. Repeat this for the other shoe. 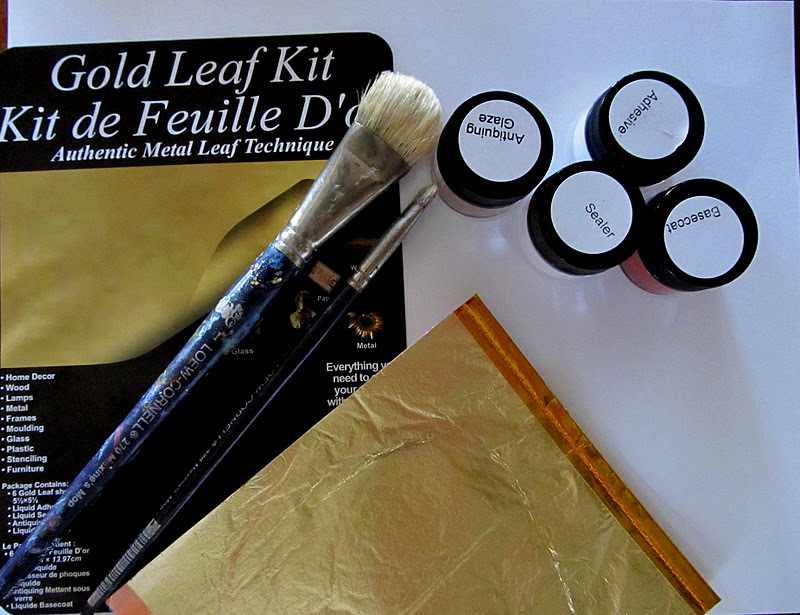 The instructions on the gold leaf kit will help you as well. just do not rub too hard. Light hands ladies. This also cleans up the extra gold. 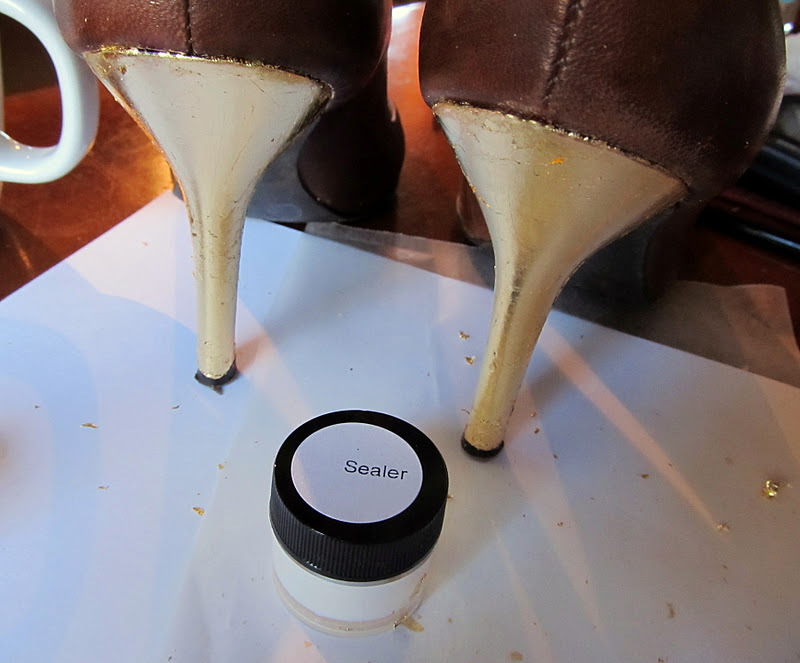 I let my shoes sit for about 24 hour before I sealed them with the sealer that came with the kit. You should NOT use a water based sealer, you need and oil based one. That is why I loved the kit, everything was there. It also has an antiquing paint you could put on, to dull the gold . Which I am debating on doing. Have a super wonderful night everyone! These r adorable and uber hip!! Those look great! 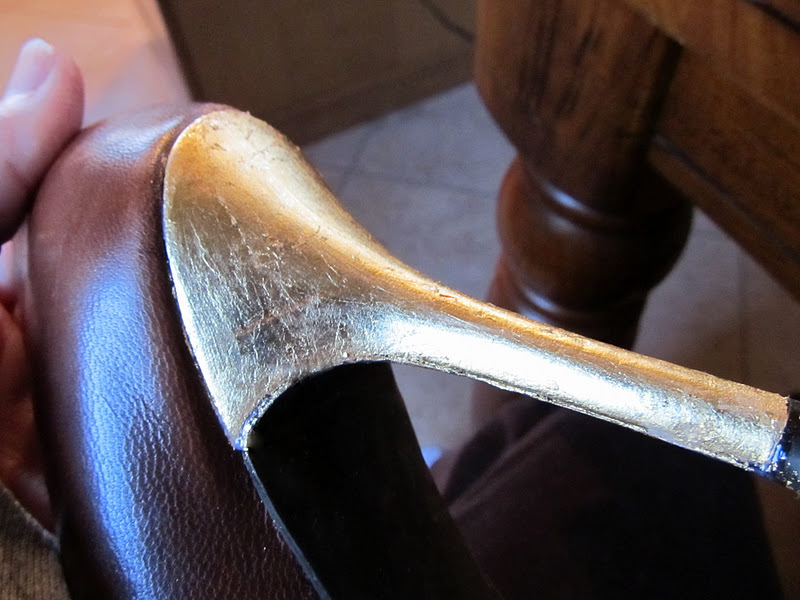 I think they would appropriate in an office work setting, or antiqueing the gold would look good too. Very clever! I don't think I will ever throw out another pair of shoes again thanks to your blog. You have inspired me to take another closer look at everything, thank you! wow great job! these look amazing. 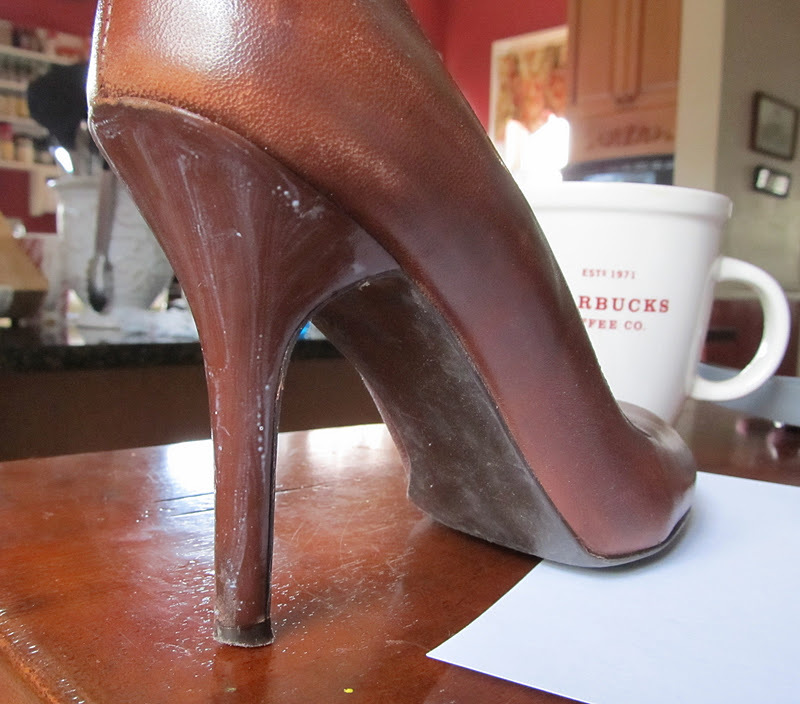 I have a pair of black patent leather pumps and the heel is in terrible shape. I think they would look really cool with silver heels but I'm not sure what to use. Any suggestions? Thanks for getting back to me on my blog! I didn't know silver leaf existed, I'll try that for sure. 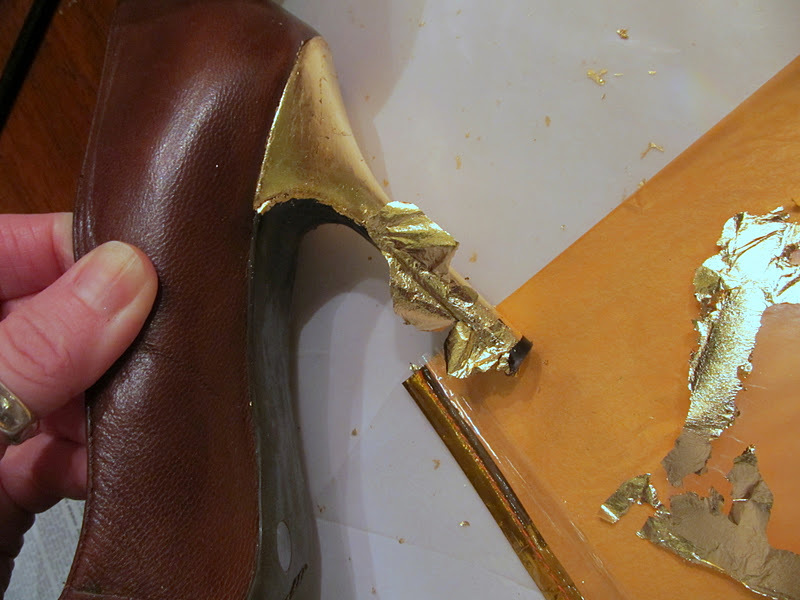 I'm so happy I can fix my poor heels! 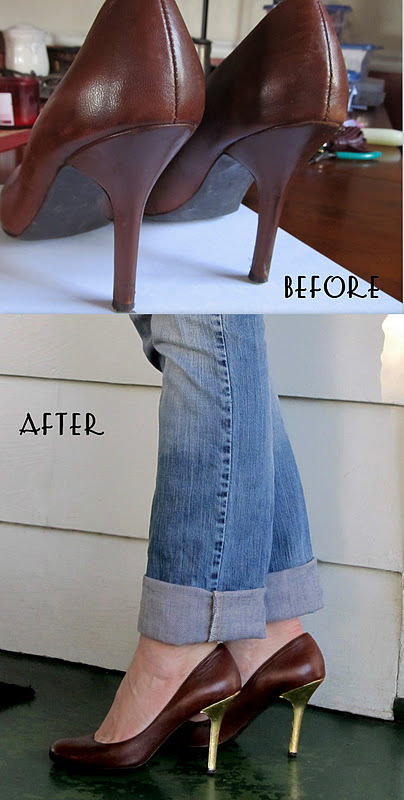 Your blog is really cool btw, I just found it today and I love all the DYI fashion tips! I should have known this was you! I've seen these floating all over pinterest!